It has been almost a year since I left the world of work defined by a contract. Included in that document was a job description and a description of salary and benefits. I had a consistent start and stop time, consistent route to and from work, and a daily/weekly/monthly schedule of meetings, workshops, and school visits. My job, like everyone else’s job, had a checklist of duties. I was on a great team. The collaboration, friendships, and “we are all in this together” mindset made working each day one of purpose and creative thinking. I do miss it and miss helping educators appreciate and then embrace the arts in education. This year has been about finding a new purpose or as aptly described, “a new normal.” I have found a rhythm for working in the studio, participating in community art events that transforms my studio into a gallery. This year I rediscovered a way to keep teaching through community education. 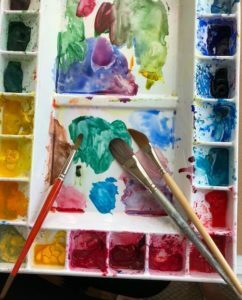 I have found another community of artists who I see through workshops and events. We connect in person and the tools of the internet. I found ways to replace what I valued in my education career into my life today. I will close with a Ralph Marston quote. The entire quote is lengthly so I will abbreviate with the statements that resonate with me. “….You already made the choice to get started, so choose right now to reaffirm your commitment. Keep up the good and valuable work and get the results you desire. So, I will get back to my “new normal” and continue to push forward. What can you accomplish today to make a goal? 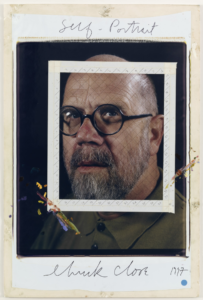 Chuck Close. “Self Portrait” 1997. MoMA Collection. The Alexandria Art Tour is over and I had an awesome weekend. Having my studio open to the public for events is not for the faint of heart. I have piles of mat board, drawing boards, crescent boards and numerous stackable bins of paint and tools that need to be removed. My drawing table gets folded up and all work is readjusted and dusted. As I tidied the studio, set up display stands I reminded my self that in 72 hours later all the moving out becomes moving in again. I go from studio to gallery and back to studio. These past months planning the logistics for an art tour are now over. I am always happy to have these events over. However, the memory of seeing family and friends, new customers, and conversations linger for many many months. It is fun to share with others what I do. So now it is back to work. It has been a few weeks, but the following advice from Chuck Close will propel me back to my work table! It is one of my favorites about the work of the artist. I am sitting at an art studio tour this weekend. Moments to blog and to reflect is part of today as well. Because of the art tour, my work is spread throughout the gallery. Some of the work is on the walls, some on easels. I look around at what I have accomplished this past year and see growth in my work. More experimenting, more exploring composition and color. I see the influence of a number of artists such as Jennifer Stone, Kathie George, Karen Knutson, Catherine Hearding, Terri Wentzka. The fruits of their labor for teaching technique, composition, color with critique and informal feedback can be visually found in the work that I have completed this year. Along with these teacher mentors there is also much to be said for painting with an informal gathering of artists. We enjoy painting together. The energy, laughter, feedback, and inspiration from others triggers me to loosen up, not sweat the small stuff, and engage with the creative process with communal spirit. Those I have worked with know who they are and how much I value the community. The community is not only face to face but on-line as well. Failures, there are many. As my mom said, “There is always tomorrow.” We all need to remember we don’t have to be right when we start. But it matters that we begin. That is my daily goal as I start each day, just begin. We all have amazing capacity to create anything, no matter how small, out of nothing. Every occupation – from painter to businessperson, teacher to chef – requires us to imagine, create, and execute ideas. And that’s exactly what has brought us this far. Don’t take your capacity to explore, discover and create for granted. So for today, begin. Do it, do it more, do it better. Use your capacity to create and do not worry about failure. Cook great food and share it. I guess I am ready to greet visitors to the studio.